Happy belated Anniversary to the Padron Family on 45 years of success of Padron Cigars. 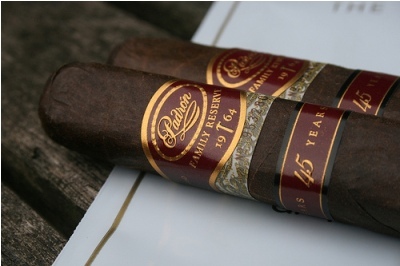 To celebrate and commemorate this special Anniversary, Padron has released a cigar worthy of this Anniversary in the Padron Family Reserve 45 Years. This Nicaraguan puro is wrapped, bind together and filled with tobacco that has been aged for 10 years and available in both a toothy maduro and natural wrappers. This cigar was rated the number one cigar of the year for 2009 by Cigar Aficionado with an outstanding rating of a 94.